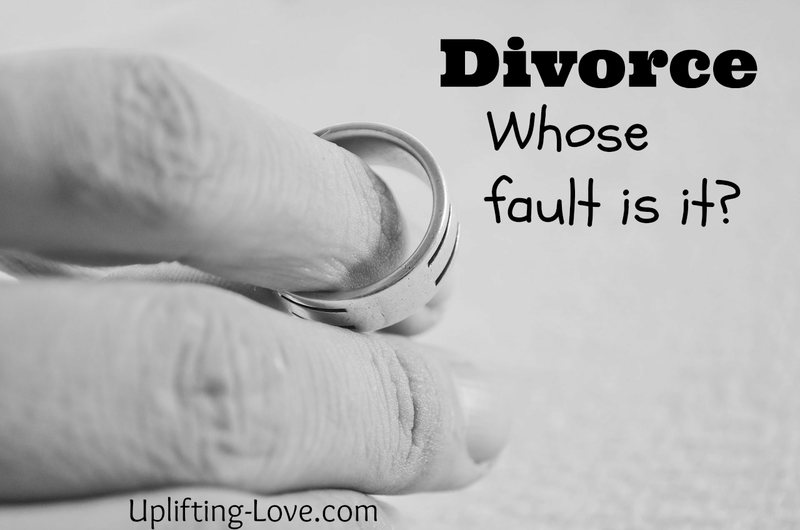 Uplifting Love: Divorce: Whose fault is it? Last August I published a post on divorce called "80% of Divorces are Filed by Women." I have been asked a couple of times for the source of that statistic and, even though I know that I recorded it somewhere, I cannot find it. Therefore, I declare that it is one of the 92% of statistics that are just made up. This has proven to be, by far, the most controversial post I have written. I have had numerous comments on the post and received emails from concerned husbands and ex-husbands explaining to me that I am wrong. In October I wrote a response to one of them. Well the feedback just keeps coming, which I think is wonderful. It has helped me realize two things. First, that men are reading what I write and thinking about it. Awesome! Thank you guys! Second, I realize I was not clear originally. Today I take the opportunity to clarify. Marriage is a three way partnership. Think of it like a triangle, which is the strongest shape according to engineer friends of mine. 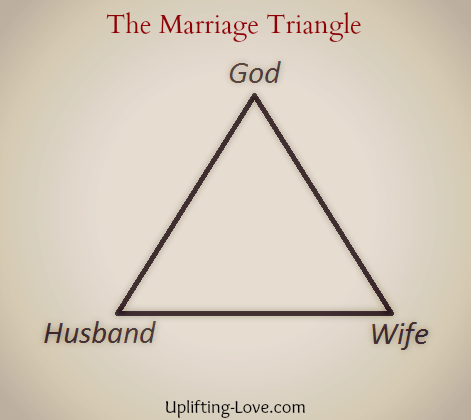 One point is God, one is the husband, and the other is the wife. If any of the sides become weak the entire shape weakens. Both husband and wife need to be continually investing time, energy, and effort into their relationship and their respective relationships with God. For one to lay blame for the collapse of a marriage one any one of the three parties while the other two walk away blameless is naive, however, I recognize that one party can "check out" of the marriage and thereby begin weakening it. I also want to note that God is never the party that checks out. One of the more recent comments I received was from a man whose wife decided to back away from the marriage. He tried his hardest to help her, to continue to love her; he applied all ten of the tactics above (just because he was trying to be a good husband, not because he had read my list) so well that his now ex-wife told him to stop. However, despite his best efforts she chose to walk away. Because marriage is a partnership and requires constant work from all three parties and because we are individuals and have the ability to make choices when one party chooses to stop participating in the marriage there is often nothing that the remaining parties can do but keep trying. Hopefully they will come around and change but sometimes, far too often, that does not happen and the marriage ends in divorce. Just because the majority of divorces are initiated by women does mean that men are better or worse at marriage than women. And I did not mean to imply that. What I want to emphasize today is that all of us, both men and women, can always do better. There is always a little bit more we can do to show our spouse that we love them and appreciate them. Let's all commit to trying a little bit harder today. If we do, I guarantee there will be happier marriages tomorrow. Joe, I appreciate your comments and the resources you shared from your blog. I visit your site regularly and enjoy your perspective. You're right that my advice and suggestions won't work for everyone. While I think it is theoretically possible for every marriage to be a raging success in today's world with each of our many imperfections it is not probable. However, I do believe that any marriage where both parties are trying to achieve wedded bliss can. It is to those marriages that my comments are directed. My apologies for not clarifying earlier. Regardless, I truly appreciate you taking the time to read and comment on this post. It means a lot to me. Take care! Most of your problem stem from not understanding the gender social contract. Men give resources for sexual access. Women consume resources and give sexual access. Men give physical protection and consume emotional support. Women consume protection and give emotional support. It is ill-advised to tell modern men to give women more emotional support. I think you are a dangerous person and giving men advice which will CAUSE divorce. Men already do more of this (companionship) than any generation of men in history and divorce is more a problem now than ever. Women have social networks of other females for companionship, they don't need the men's companionship that badly. Until we are brutally honest about what the genders want, value, and need from each other we will continue to see decadent rates of divorce. One last point, if a man dies before his elderly wife she can live on for decades. But if a wife dies before her elderly husband he will likely die soon. Men do not have intricate expansive networks of social support. Their wife is their support. This is why divorce is so horribly excruciating for men and so fundamentally evil for how it deals with them. It deprives them of their entire social support system: their one love. If you still think the flow of companionship should be neutral or flowing towards the woman you are just being irrational. Your 10 points are destructive advice and will exacerbate the divorce epidemic. Humans are wired this way at a core level. Women may THINK they want more companionship, but they want less. Obviously men should provide some support, just like women should provide some economic support for the family, but when you approach equal contributions it makes the idea of having genders at all redundant. And the gender whose strength is being dilluted in strategic value will despise the other, whether that is a man being too emotionally supportive, or a woman earning more than her husband in the workforce. The genders want and need to have unique contributions they bring the relationship to feel both valued and a unique individual. It is ironic that your advice is more likely to destroy marriages than helping it. A women will be happy in a marriage if she wants to be happy. She will be unhappy if she wishes to be so. That is the rule. A few situations may violate that, but the modern world has made women expect very unrealistic things form their husbands. No man can fulfill that and women, even Christian ones, regularly dump their husbands for a better opportunity, or even just to get him out of the house and her life since she can still get his support by way of the State. Consider who is being worshiped there. The Scriptures present the husband as the leader, however anathema that is to many today. I can understand the worldly opposing that, but seeing those who name the name of Christ is really astounding. It would take several blog posts to iterate all the issues involved, but know that you have a far too simple view of things. I pray your wife never decides she can do better and you learn the bitter truth of the way things work now in that case.